What are the different types of peripheral vascular disease? Peripheral vascular disease is narrowing and blockage of the blood vessels that supply blood to the arms and legs. It causes a reduction in blood flow to these areas. In most cases, the legs are affected. 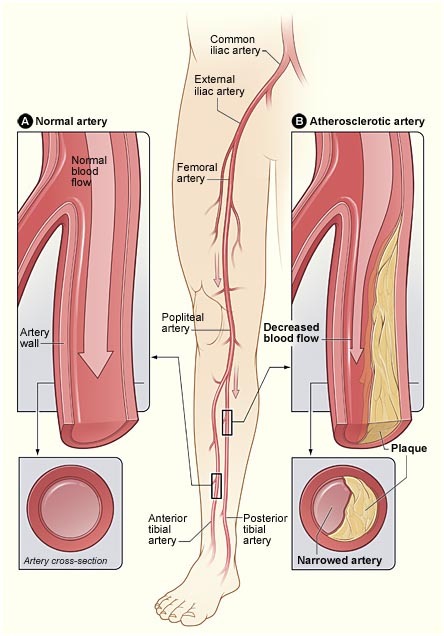 Peripheral vascular disease is usually caused by atherosclerosis. Atherosclerosis is hardening and narrowing of the arteries caused by a build-up of fatty plaques on the inside walls of blood vessels. The plaques can eventually completely block the flow of blood through the arteries. Diseases affecting peripheral blood vessels can also increase the risk of peripheral vascular disease. These include Buerger’s disease and Raynaud’s disease. For example: Raynaud's disease or phenomenon, a condition in which the smallest arteries that bring blood to the fingers or toes constrict (go into spasm) when exposed to cold or as the result of emotional upset. This disease happens most commonly in women between the ages of 18 and 30. For example: Buerger's disease (thromboangiitis obliterans), a chronic inflammatory disease found chiefly in the peripheral arteries and veins of the extremities. This disease most commonly happens to men between the ages of 20 and 40 who smoke cigarettes. Symptoms include pain in the legs or feet, clammy and cold skin, and a diminished sense of heat and cold. Peripheral vascular disease can be quite advanced before symptoms occur. Symptoms depend on the severity of the blockage. Pain or cramping in the affected area is the main symptom and is usually one of the first symptoms to develop. It may begin as an achy, tired sensation in the affected muscles when exercising. Typically, pain or cramping in the calf muscles occurs when you walk or exercise your legs. The pain goes away when you rest but may recur if you start walking again. As the narrowing worsens, the pain becomes more severe and symptoms may occur even during light exertion. Eventually, the area is sore all the time, even at rest. Pain may be felt in the thighs and buttocks if the arteries leading to the thighs are affected. One or both legs may be affected. Numbness of the feet and toes. Skin changes on the legs and feet: skin may be pale or bluish, thin and shiny, or dry and scaly; loss of hair may occur on the tops of the feet and the nails may become thickened. Slow healing of any injuries such as cuts and scrapes. Ulcers may occur on the legs (can be painful and difficult to heal). 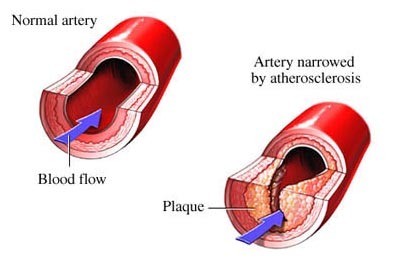 Symptoms of ischaemic heart disease (angina and heart attack) caused by atherosclerosis. Peripheral vascular disease usually develops gradually and symptoms progressively get worse. 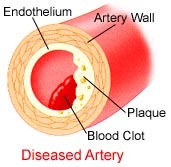 However, acute symptoms may develop suddenly if an embolism occurs (part of a blood clot breaks off and becomes lodged in a narrowed artery) or if a blot clot develops in a blood vessel already narrowed by an atherosclerotic plaque, causing sudden restriction of blood flow. The limb will become cold and numb and pale or bluish. Contact your doctor immediately if your symptoms suddenly become more severe. Your doctor may suspect peripheral vascular disease because of your symptoms (calf pain on walking, relieved by rest). He will enquire about risk factors for atherosclerosis and will examine you. Your weight and blood pressure and the pulses in your feet, legs, and groin will be checked. Blood tests for blood sugar and cholesterol levels. Angiogram - a specialised test using dye that shows the flow of blood through the arteries and identifies the location and degree of any narrowing or obstruction. Doppler ultrasound - uses sound waves to show blood flow and to identify any obstruction. The main priority is to identify and treat risk factors for peripheral vascular disease and minimise the progression of atherosclerosis. Stop smoking - nicotine causes vasoconstriction (narrowing of blood vessels) and is a major risk factor for the development of atherosclerosis. Blood sugar should be controlled in people with diabetes. Lower cholesterol and lipid levels. Keep to a healthy weight - eat a diet high in complex carbohydrates (whole grains, pastas), fresh fruit, vegetables, and fibre, and low in salt, animal fats, and refined sugar. Exercise regularly - Walking 30-60 minutes per day is ideal. Walk until pain begins, rest until the pain disappears, and then resume walking. The goal is to increase your walking distance gradually as the symptoms improve. Avoid injury to the affected leg. Proper comfortable shoes. Safe terrain, and safe exercise equipment are important during exercise. Avoid infection by taking good care of your feet. Wash your feet and change stockings daily. Infections in the affected area should be treated promptly. Trim your toenails straight across. Avoid any medications that may cause narrowing of the arteries. The blocked area is removed and replaced with a piece of vein taken from another part of the body (graft). Sometimes synthetic material instead of a vein is used for the graft. Abdominal surgery may be necessary to treat blockages in the arteries supplying the legs. In some cases, blockages can be treated by inflating a balloon at the tip of the catheter to widen the area around the blockage. In some cases a stent (tiny tube) may be inserted into the artery to help keep the artery open. In severe cases, where surgery is not possible and gangrene (tissue death) occurs, amputation of the foot or leg may be necessary. Patients with gangrene are at risk of life-threatening infection. Eat a diet low in fat and refined sugar, and high in complex carbohydrates and fibre.